the exchan ge of oxygen and carbon dioxide takes place. The air becomes trapped into the alveoli due to alveoli damage, causing more damage by expanding and rupture in alveoli. Emphysema is part of the Chronic Obstructive Pulmonary Disease (COPD) umbrella, together with chronic bronchitis and bronchiectasis. 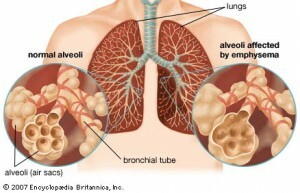 Emphysema treatment consists mostly in slowing the progression of the disease and acute treatment. The classical medication are bronchodilators, steroids, antibiotics for infections. There are natural, long-term treatments for emphysema to help slowing down the progressions – such as diet, physical exercise, supplements (vitamin D, antioxidants, Omega-3, CoenzymeQ10..) and salt therapy. Salt therapy is very beneficial in emphysema and helps to slow down the progression of the disease. It is a long-term treatment but it can be easily used in the comfort of your own house. Salt therapy at home by SaltAir device is easy to perform. The device releases tiny particles of salt into the indoor air for free breathing. You will need to place the device on a nightstand, next to your bed, to benefit for the entire night. In a chronic breathing problem, such as emphysema, daily exposure to the salt aerosol is necessary for good results, preferably during the night sleep. The salt particles penetrate deep into the lungs, to alveoli, and help to maintain a good hygiene over the whole respiratory system. It helps to fight infection, to clear the mucus, to reduce the inflammation and strengthen the respiratory immunity. There are numerous risk factors that contribute in developing emphysema such as smoking, passive smoking, harmful pollutant fumes, aging, genetic background and unhealthy lifestyle are few factors that can contribute in developing emphysema. To better understand emphysema and what happen in emphysema, treatment in emphysema – both classical emphysema treatment and natural treatment in emphysema, please read at emphysema symptoms.